How do you know you are obese? Can we do several regions at once? Moles are common and almost every adult has got a few moles. Moles are brown or black skin growths and may appear anywhere on the skin, but most of them appear on the face, more frequently below or on the eyelids, upper cheeks, forehead, in neck folds, back and chest areas. In fact, moles can appear practically anywhere on the body. 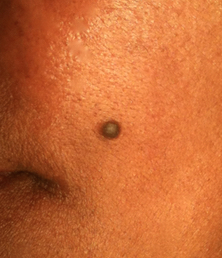 Some moles may appear in ealry childhood and some may appear during late childhood or adolescence till early adulthood. But some moles may appear late in life. Different adults may have different but normal amount of moles - between 5 to 50. Moles may grow with time, usually changing slowly and becoming bigger and changing to darker colors. Some moles may develop hair but some may not change. Moles are usually bening in character but sometimes they may change to indicate skin cancer. The medical term for a mole is "naevus"or "nevus"; in plural "naevi"or "nevi". For skin cancer screening, you need to see a specialist doctor if a mole starts to grow, itch or bleed. You should not worry too much about your moles. But you need to know that a skin cancer, known as melanoma, can grow in a mole. However, if diagnosed early, a melanoma can be treated and cured. The first sign of a melanoma is frequently a change in the mole. So having your skin checked by a specialist doctor (dermatologist or a plastic/aesthetic laser surgeon) can help you find your melanoma early and have it treated by laser. Up to date no moles have been seen to recur after laser removal. "We care for you as no one else does"
All consultations & treatments only on appointments. Thanks.